Sweet, slight and soft-spoken, one wouldn’t picture Phwe Yu Mon as an activist. But from the moment I met her in July earlier this year, she’d told me about the peace work that she was involved in back in her home country of Burma. An ethnic Kachin, she wanted to do her part in campaigning for the end of the civil war in Kachin State — a war that had not come to an end despite the numerous changes that have taken place in Burma since the civilian government came into power. According to Article 18 of the Assembly and Procession bylaw in Burma, official permission had to be sought for the staging of a public gathering. The activists had tried to apply for a permit for the event, but were unsuccessful. Breaching Article 18 could attract a maximum sentence of one-year imprisonment and 30,000 kyat fine. However, since the march passed through 10 townships, now the activists are facing the possibility of having 10 counts of breaking Article 18, which means that they could each receive up to 10 years in jail. The news of possible charges against Phwe and her colleagues popped up in our Facebook group of young Southeast Asian advocates. The response was swift; after all, “one of our own” is being targeted here. Suddenly people in the U.S., the Philippines, Vietnam, Malaysia and Singapore (just to name a few) began discussing campaigns, statements and messages. Scattered all over the world and often occupied with our day jobs or studies, how can we come together to build something to help a friend out? How can we amplify the message she has worked so hard to push into the global public consciousness? One thing is clear: despite the many surprises the world has seen from the civilian government under President Thein Sein, there are many ways in which things in Burma have not changed. Despite the removal of pre-publication censorship, there is still no freedom of expression in Burma. There is still control over what people can or cannot say and what they can or cannot do. With the police having the power to withhold permission for activities such as peaceful protest marches, expression is still very much regulated, and things have not got much easier for activists working on sensitive issues. For many ethnic minority groups in the country — such as the Kachin — things have also not changed very much. Kachin State has been caught in a bloody civil war since a 17-year ceasefire came to an end last year, with over 75,000 Kachin civilians driven out of their land. In Rakhine State, Rakhine Buddhist and Rohingya Muslim communities have been in violent conflict for months, with many on both sides killed or displaced. Although the country has made some progress over the years, there is still a long way to go to bring peace to the whole of Burma. It’s not a struggle that the Burmese people can overcome on their own. In such a period of transition, international attention and pressure can still play a very significant part. Burmese activists have thus been lobbying international groups and organizations. The building of networks with fellow advocates and supporters around the world — such as the friendships built at the Southeast Asian youth media camp in July — have also provided more opportunities and platforms to get the message out. As we discussed strategy and goals, we quickly realized that just speaking out for the 13 would not be enough. We would also have to keep up with the issues the activists had risked so much for. The struggle for peace and the end of civil wars in Burma had to continue. 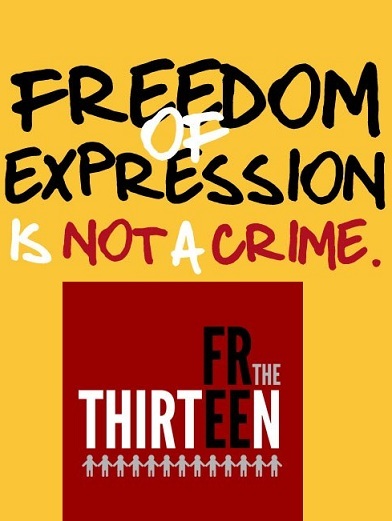 And so, on top of an expression of solidarity and support for our friends, the campaign to Free The Thirteen also aims to keep highlighting the lack of freedom of expression and peace in Burma. Aftermath of the Cold War ending, a return to tribalism of sorts, or just an availability to be heard now? As American Sharks circle for yet another attack to compensate for diminished returns, the truth of capitalism’s shortcomings will only grow more acute while accelerating. So, the Kachin and the 13 are the latest casualties between the Sharks, a fragile government, and the military.